Your water heater is beginning to show signs that it might need to be replaced. You already knew it was probably going to stop working, after all it is getting older. The water is not as hot as you would like and the water is taking on a rust color. Taking a bath is not very much fun in brown water. It is time to call in an Expert Water Heater Replacement in Phoenix, AZ. with a new energy efficient model. Our company, 4fathers plumbing and home services can remove your older hot water heater, upgrade your exhaust vents to bring them up to code and install a new water heater. Water heater replacement is made easy with our home services and our expert technicians. Many consumers will order a water heater from a supplier of their choice. 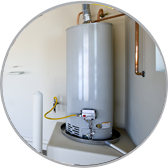 We can work with any model and manufacturer to install your new water heater in your home. Most new water heaters are much more energy efficient than the older models. While no one really wants to spend money on a new water heater, at least you will save money with a new energy efficient model. Using less energy to heat your water is always a win for the consumer. Using 4fathers plumbing and home services to install your new water heater is also a win. Expert Water Heater Replacement in Phoenix, AZ. replacement will be easy for the customer. We clean up everything and remove all the unneeded packaging etc. One concern many home owners have is adhering to the latest building code. Our technicians are fully trained and keep up to date with all building code changes. We will bring your installation up to code as needed. Call 4fathers plumbing and home services today for your water heater replacement and any other plumbing needs that you may not have.